This is the corn bread I always make for my family. I have adapted it from Sue Gregg to make it dairy free. 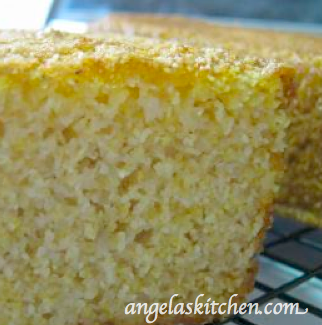 This corn bread is very soft with a hint of sweetness. Overnight soaking works wonders! The night before you want to make corn bread: In a blender place milk substitute, lemon juice or cider vinegar, olive oil, maple syrup and corn meal. Blend at high speed 3-5 minutes (the blender will “grind” the grain into a batter). Let sit covered on counter overnight. The next day, when you are ready to bake mix in thoroughly, but briefly, eggs, baking powder, baking soda, and salt using blender or a rubber spatula. Pour batter immediately into greased 8"x8" baking pan. Bake at 350 degrees F 25-35 minutes or until knife or toothpick comes clean out of center.